The Octo Samurai is unlike any boss from Splatoon 1. This is a one-on-one battle, there aren't any gimmicks or puzzles or traversal tricks. It's all about battling it out with a special enemy and watching his tells. 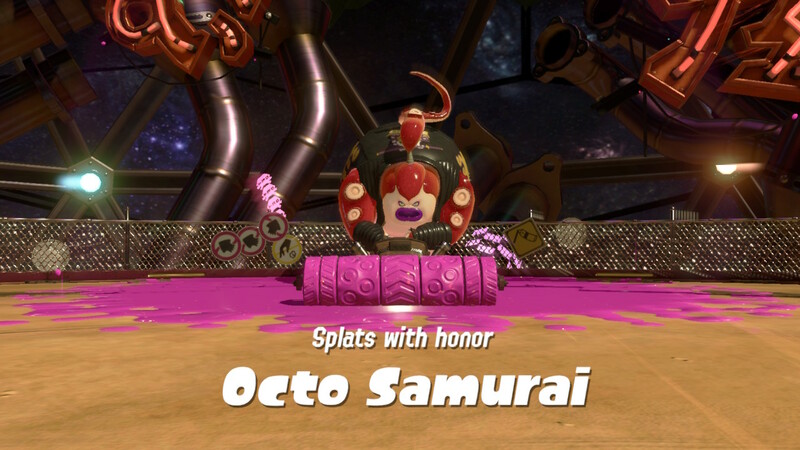 All you have to do is splat the Octo Samurai to win, but doing that and not-dying is a surprisingly tough proposition. If you're looking for help, or just want to read up on the awesome Octo Samurai boss, check out the step-by-step guide below for a full breakdown and gallery. The Octo Samurai is the boss of Area #2: Suction-Cup Lookout. Collect all six zapfish to unlock the boss kettle in the center of the zone. 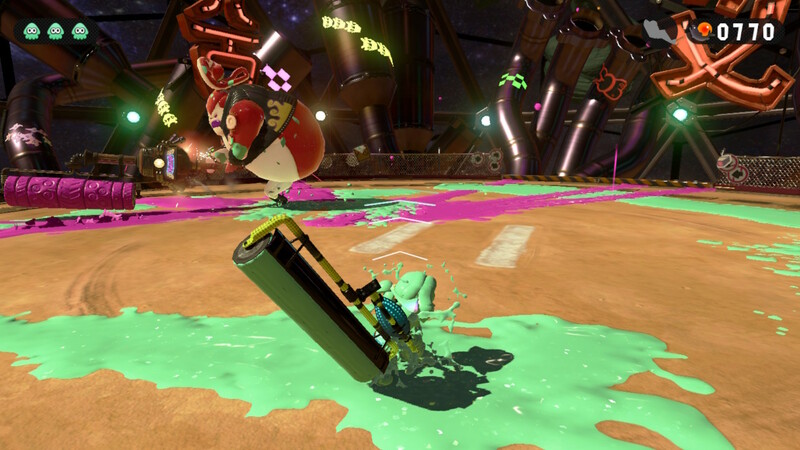 For this fight, you'll be forced to use the Roller on your first fight. The Octo Samurai won't go easy on Inklings, so you better be prepared for this challenging battle. 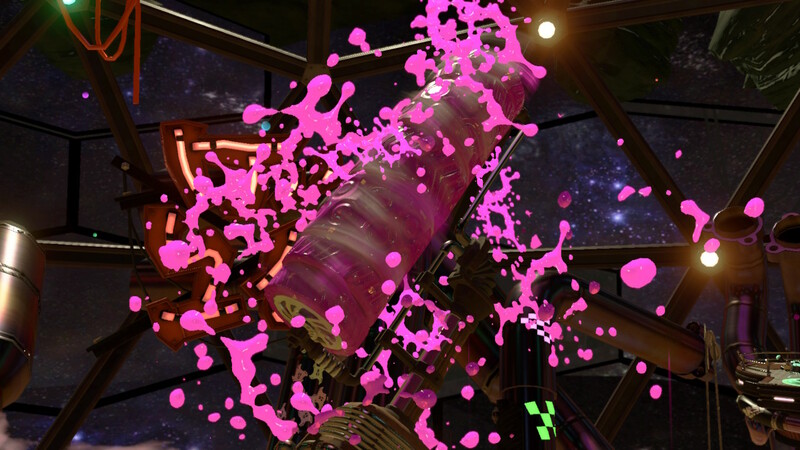 Sheldon requests that you use the ink roller for this fight, so you'll need to keep a few things in mind - basic attack [ZR] sprays a close-range blast of ink. 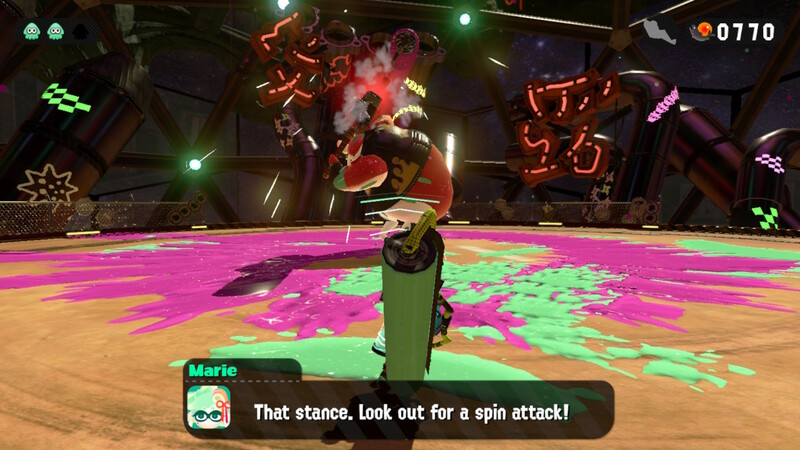 Jumping and using [ZR] shoots a longer ranger, concentrated line of ink straight forward, and hold [ZR] rolls, creating a nice escape route if you get in trouble during the fight. 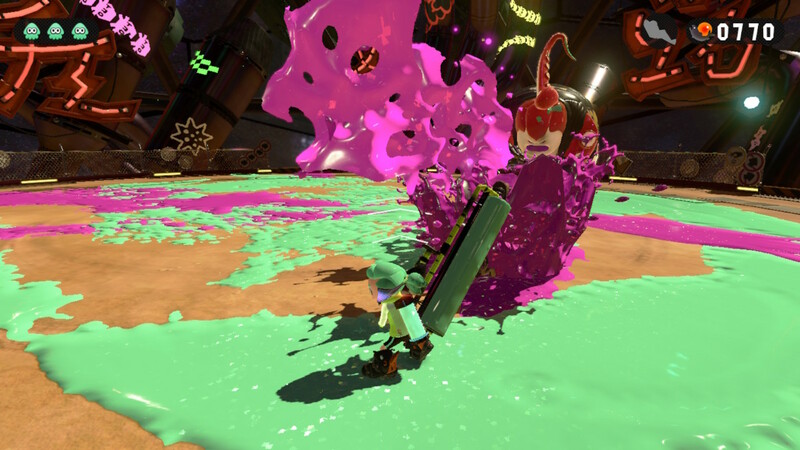 Tips & Tricks: To make this battle much, much easier, use the jump + [ZR] attack to create long lines of ink that your inkling can use to quickly create a squid-form escape path! There's no tricks or gimmicks to this fight! 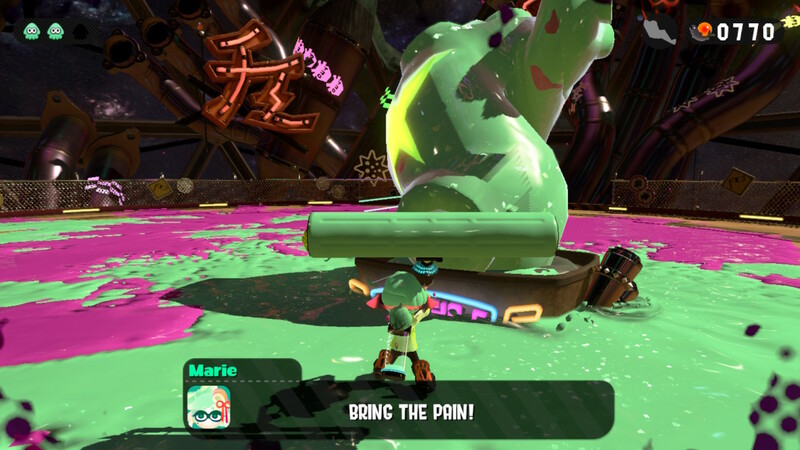 Nope, you've just got to splatter the Octo Samurai with ink until his tentacle weak point appears. The problem? He's quick, loves to jump around, and splatters ink all over the place. 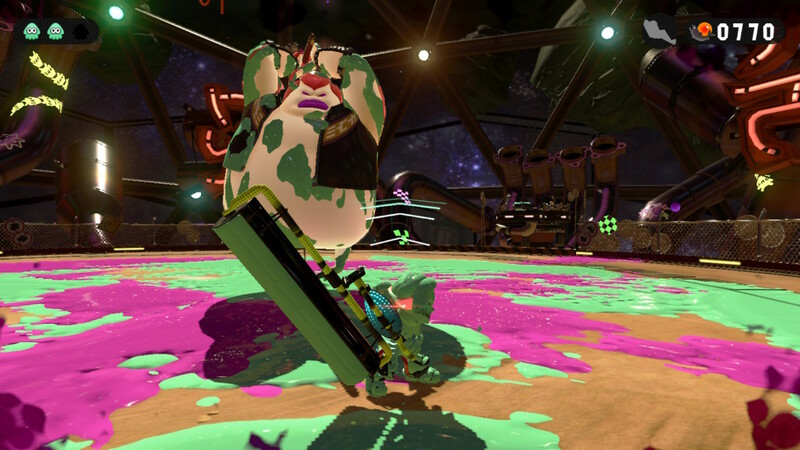 If you're not careful, the Octo Samurai can totally splatter you. No problem. Phase 1: The Octo Samurai uses two attacks - he will slam his roller forward in a straight line, or he will rev up his engine and roll toward you. 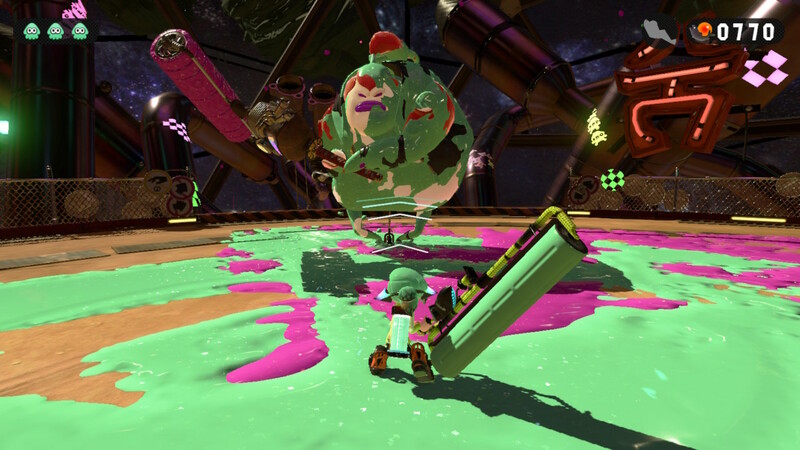 When he uses vertical swings, stay close and move left / right, then use your close-range [ZR] splatter to dish out damage. 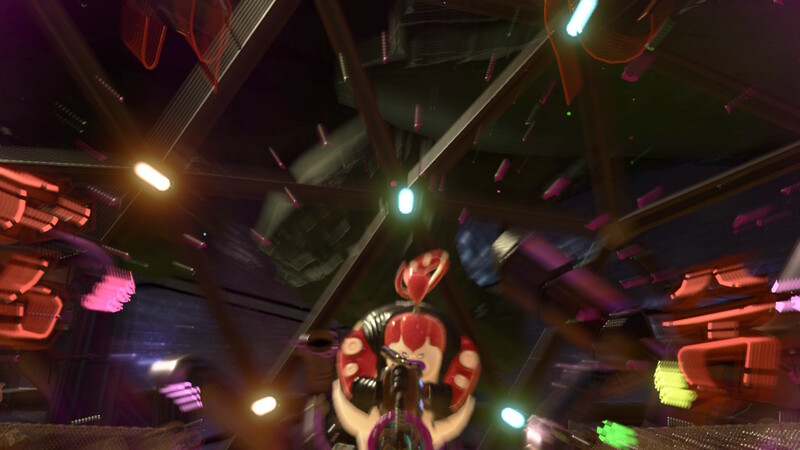 The Octo Samurai telegraphs his rev up attack when his engine roars and he retreats to the outer edge of the arena. Quickly make a path with a jump-[ZR] attack to squid-form out of its path. 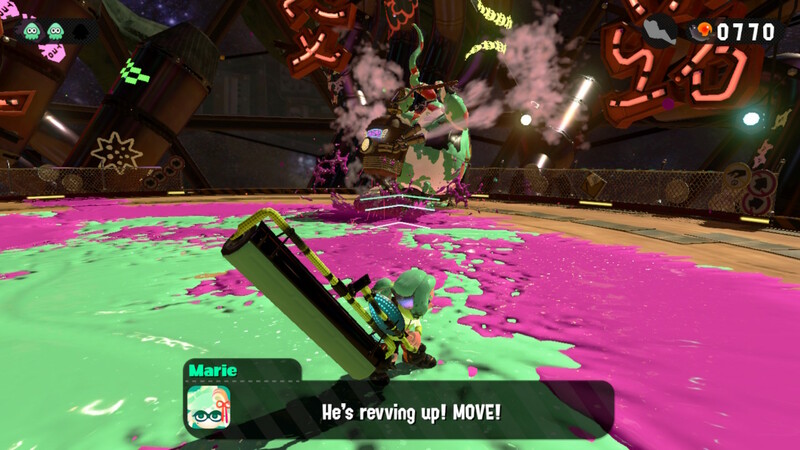 When you do enough damage to the Octo Samurai, he will reveal his weak point tentacle. Blast it to move on to the second phase! You know how it's done. Phase 2: The Octo Samurai gains a few new moves during this phase. Now, he'll use a jump-attack from across the screen. Keep on your toes, and wait for the Samurai to try his vertical strikes - he'll attack much faster this time. After three strikes, he'll be exhausted for a moment, giving you a safe time to attack. You can also interrupt the Octo Samurai's attacks at any time. Stay close and dodge his vertical swings, then counter with regular old [ZR] splats to send this ugly samurai reeling. 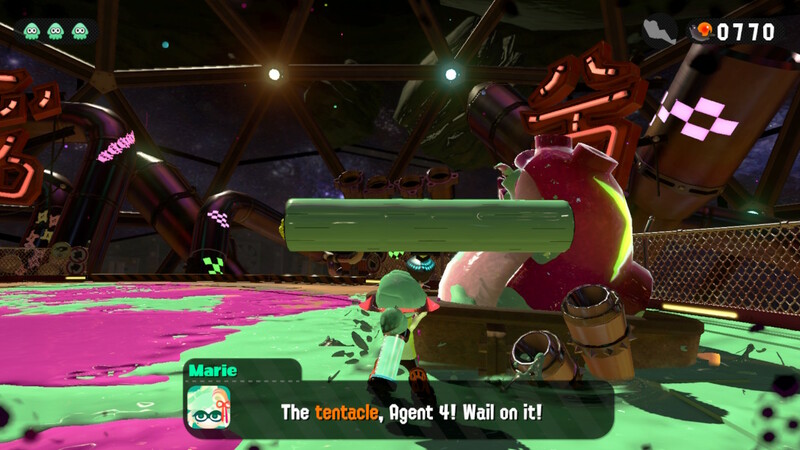 The worse new attack the Octo Samurai uses sends ink in a wide circle. The Samurai's eye will glow when he spins. Immediately retreat - or, if you have awesome timing - you can jump and avoid damage. A good jump in squid-form can keep you safe and close to the Samurai, so you can start attacking him even more. Phase 3: Once again, Octo Samurai gets new wrinkles to his attacks. Now his vertical swings launch a straight, long line of ink across the arena. Nowhere is safe, so dodge even if you're far from the samurai! The rev up engine attack will also change directions once. He'll chase you straight, then readjust and speed toward you again, so keep moving or you'll get run over flat. Otherwise, the Octo Samurai is the same. He whips out more spin attacks if you stay close, jumps away more often, and generally attacks faster. 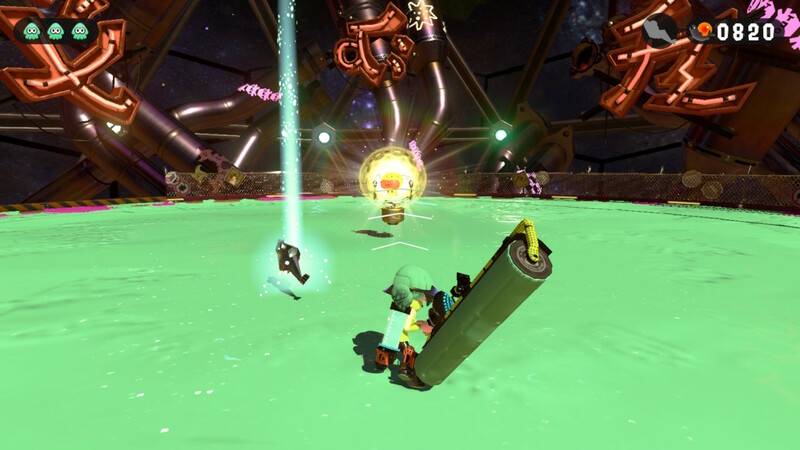 Keep making paths with the ink roller, jump+[ZR] to create escape ink lines to squid-form through, and stay topped up on ink. 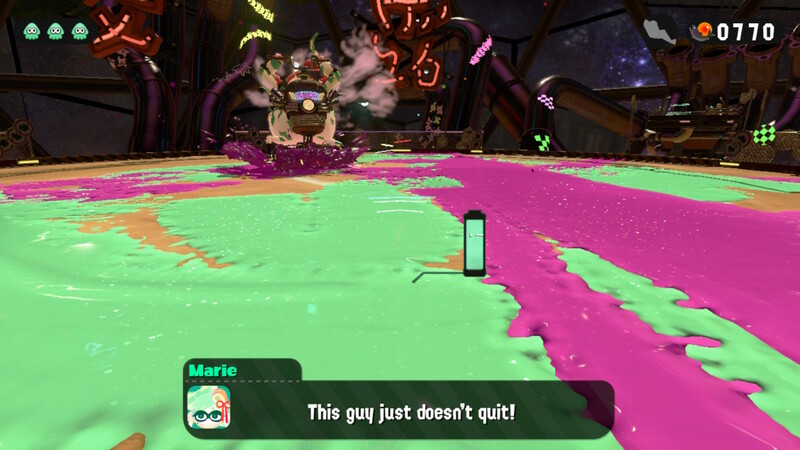 Get close and slam him with lots of ink attacks, then retreat if you're weak and just hang back until you regenerate. 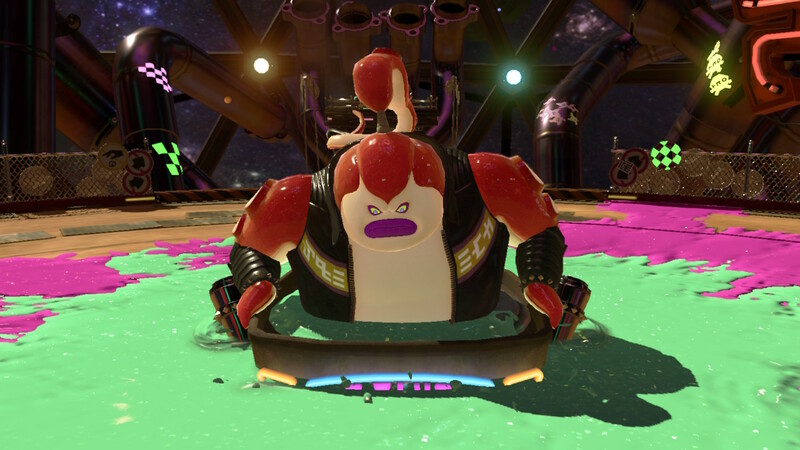 The Octo Samurai is mean, but doesn't get too offensive. Keep circling him and he'll splat in no time. After this difficult battle, you'll encounter an old friend in Area #3. Prepare for the return of the Octo Stomp!